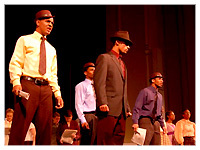 "...It took courage to bring Ragtime to campus because until now, PEMCo had never done anything like this before. It took guts to expose race on a campus which has struggled with race and difference for generations. It took faith to trust that what you were doing would make us a better community, and therefore better Christians, better Catholics. Your ancestors laid the foundation for this country on terms that excluded and exterminated entire races. As you prepare to graduate and enter into a global society, you are making a bold statement about your hopes and dreams for this country and your Church. You're saying to those in my generation, "We want to do things differently. We want to broaden and live faithfully the meaning of 'Christian, ' of 'American.' We may not understand fully the emotion attached to race that belies our history and inability to live as one, but we certainly feel the tension and refuse to pass it on to our children." Welcome to the Pasquerilla East Musical Company's 10th anniversary musical. Since its founding ten years ago by Kelly McGann, PEMCo has become more than just a production company; it is a community of friends that devote their artistic talents toward a common goal. There is not a better way to foster meaningfull and enduring relationships. That is why we are here. Thank you for joining us. We hope this experience will mean as much to you as it does to us. "So, Why Ragtime?" This is a question I have been hearing a lot since last June when this project began. I imagine it is on your mind. We picked Ragtime because we wanted a challenge. 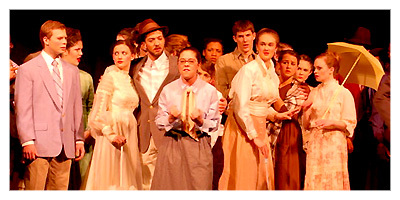 Ratime is a demanding production that calls for a full orchestra, intricate sets, a diverse and extraordinarily talented cast, many props, costumes, and meticulous organization. We also picked Ragtime because it confronts issues of racism, economic inequality, immigration, and probes the meaning of the American Dream. One way or antoerh, it is a story with which we can all relate. We invite you into the minds and hearts of our characters in the world of New York City in 1906. We ask you to observe the differences in race, backgroun, and personality. We hope that you perceive how the characters emerge from their stereotypes, in their moments of courage and cowardice. What do you think of America, then and now? Is our American Dream our delusion or our potential? How far have we come from the mistakes of our past? Where can we progress into our future? Ragtime is meant both to entertain and to challenge. We want to scrutinize our actions and ideas in search of what is right and true, not merely saying and doing what we already think and feel. Apathy and ignorance are the universal parents of racism, inequality, violence, and greed. Thus, these are the problems we invite you to contemplate. We believe that together we can overcome them. I hope this story helps you come to this same conclusion, and have some fun on the way. This production would have been impossible without Brad and Tim overseeing the club, Andrea, Emily, and Anna making creative calls, Jenna organizing our whole operation, and Thomas building the set. These people are at the core of this year's success. Still, at the front line are the people you see before you: our cast, crew, and orchestra giving you our finished product. This show depends on so many pieces being gracefully put together. Finally, we give very thanks to you, the audience, for coming to support our production. And the things you'd like to forget, you don't." -A very wise woman, a stranger, in the dental office. Many things can be sterotyped about a people: most often, their trials and tribulations. However, for the many individuals who came from "disadvantaged" backgrounds, those things belittled, or forgotten all together, tend to be the few and far between extreme tribulations (usually, attained by a minority within a minority). On the other hand, the trials were, time and time again, conciously put at the back burner by a majority "one mind." The only way to fully understand anyone, let alone a people, is take them as they are, tribulations and trials. A history, including both the overarching and individualistic, must be taken into account. The only way that we can better understand ourselves, as a human race, is to know where we came from, understand where we are presently at, and have an idea of where we should be in the future. 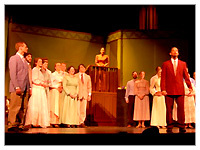 In sharing with you the story of Ragtime, we remember our country in 1906. Just over a century later, it is important for us to reflect on this portrayal of our nation, which reveals a society divided. The rich diversity of 1906 America, with the potential to develop ideas and spread culture, was injured by a closemindedness characterized by racial discrimination, prejudices, and slurs. 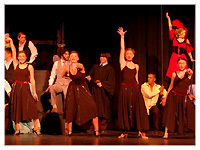 The production showcases some ideas that were able to succeed, from mass production to movies, in addition to the notable culture of the music and dancing of Harlem. But it also exemplifies what is lost when any human being refuses to accept another. Ragtime, a show full of powerful beautiful music that has been embodied by the members of this cast over the past few months, tells a story that forces us to examine the past of our country - and also to consider our present. When I read each day's news stories, I realize that our world has not come all that far since 1906. All I know that there is still an important place for the story of Ragtime's characters, who cope with issues that continue to plague people and nations today. The experience of working on this production was one of total contrast to the headlines that capture the social ills of our world. Knowing the members of this cast, and watching them grow both as characters and people, gives me hope for the abilities of our generation to truly move forward. 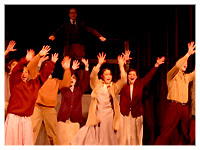 Our cast members have succeeded in communicating all of this through their acting, singing, and dancing - so please, first and foremost, enjoy this production for its value as a piece of music theatre. I ask only that later (and perhaps inevitably) you consider the implications of the beautiful theatre you are about to watch. None of this could have been achieved without the concept and guidance of Jack, the powerful presence and ideas of Anna, or the huge musical talent and teaching skill of Emily. Or without the amazing organization of Jenna and her team. My role in this production could have never been completed without my wonderfully reliable dance captaing (truly co-choreographer) Melinda. And of course, not without the ever-present knowledge, willingness, and action of producers Brad and Tim. Thank you. Certainly, nothing would be appearing on this stage tonight without our cast - their talent and presence and personalities have made this experience more worthwhile with each rehearsal. And finally, thank you to our audience members, especially to friends and family who have traveled from across the country to support this production. As the theatre is filled and all anxiously await the entrance of the conductor and that first glorious downbeat, we, the audience, have no comprehension of the changing power we are about to experience. I believe that music speaks to us in deep and often unknown ways. It is the language of love, agony, happiness, joy, sadness, rage, laughter - the universal language. In my brief 21 years I have only even begun to fathom the incredible influence that music has and will continue to have on my life. As your humble music director, it has been my great honor to share my love and music with this extremely talented, loving, and passionate production staff, cast, orchestra, and crew. Working with these young men and women has been a constant source of inspiration and joy in my life. To all of my Ragtime family - Thank you. "You and your music, singing deep in me, making nice to me, saying something so new. Changing everything, meaning everything. Music, calling my heart to you. Play that melody, your sweet melody, calling my heart to you. To all of our dear audience members tonight - Thank you for sharing in our music. One day you too will begin to realize the wonderful imprint that will be left on your heart this evening. "It's just like that tune, simple and clear. Come to hear New Music! Breaking your heart, opening a door, changing the world! New Music!" I know that I will "Hear it forevermore." Thank you and enjoy the show! 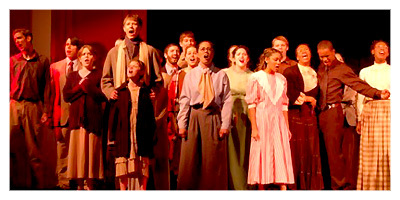 Last spring, the Pasquerilla East Musical Company was coming off a "Footloose" high. 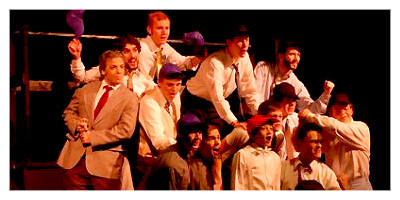 The student-run University of Notre Dame theater group had staged the high energy, sing-along show as its annual musical production, and when it came time to decide on a show for 2007, its members hadn't lost the upbeat buzz. Jack Calcutt, however, was set to direct. He knew what he wanted, and he wanted "Ragtime." 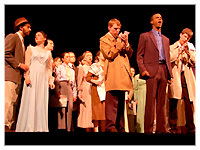 Calcutt pushed hard for this 1998 musical based on the E.L. Doctorow novel, a dark but ultimately redeeming story about issues of race, class and gender in early 20th century America. The production would be complex and daunting. It was not an easy sell. "Some (musical theater is) meant to be fun and light, but 'Ragtime' really has a lot of substance to it," Calcutt says. "You go through the scenes, and there's laughing and crying, death and comedy. ... There are really developed characters who make a progression throughout the show, and they make that progression during a revolutionary time in American history." Staging the show would require outreach efforts to secure a diverse cast, and Calcutt saw that as an important goal -- something that could be a pillar of what their group is all about. Thanks to Calcutt's persistence, Tim Masterton and Brad Lancy, the co-producers of the show and co-presidents of PEMCo, came to embrace his choice. 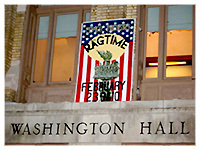 This weekend and on Feb. 9-10, the company will present an ambitious, large-scale production of "Ragtime" at Washington Hall on campus. Counting the pit orchestra and the crew, about 80 people are working on the show, including a cast of 48. There are a number of rich, textured musical numbers in a variety of genres, and the dramatic story unfolds almost entirely through song. "Ragtime" follows the lives of seemingly very different people (among them, a black musician, a Latvian Jewish immigrant and a rich Protestant mother) who find their lives intersecting in surprising ways. A few historical figures take the stage as well, including Harry Houdini, Booker T. Washington and anarchist Emma Goldman. 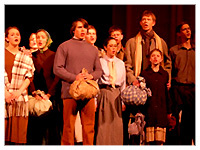 The show's characters face violence, prejudice, poverty, the death of loved ones. Some are crushed under the weight of it all. Others have the opportunity to rise above. 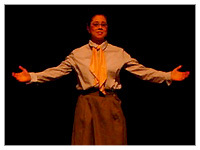 Jacqui Acuna, for instance, plays the role of the wealthy white mother. In the beginning of the play, she's passive and feels utterly lost when her husband takes off an an extended trip. Without him, however, she encounters a young black woman, Sarah, and her baby. After taking them into her home, her life changes dramatically. When her husband returns, he finds his wife has become an independent woman of strong convictions, a woman he barely recognizes, a woman who cares deeply for the people she's taken in. As assistant director of acting and outreach, junior Anna Mazig was instrumental in helping the group find the diverse cast it needed for the show. Calcutt had approached her last spring about joining the group and helping the recruitment effort. "Ragtime" features people from "so many different walks of life," she says, and to have a cast that reflects that really drives home the show's theme. "Just to see everybody up there doing their part in such an amazing way -- it really highlights the beauty of the musical itself," she says. One of the group's newcomers is sophomore Kyle Carter, who plays the part of Coalhouse, a Harlem musician. Carter says he also dealt with the controversy surrounding the production. That's why he researched "every inch" of the play in order to defend it. In the process, he's convinced some of those who questioned "Ragtime" to come see it. Carter is an experienced singer who was talked into auditioning by his friend, PEMCo member Wendy Pepper. Carter admits he took a look at the audition song about 10 minutes before his tryout. He went in pretty half-heartedly. As he learned more about the show, however, and more about Coalhouse, his feelings changed dramatically. The song he had glanced at so briefly is called "Wheels of a Dream." 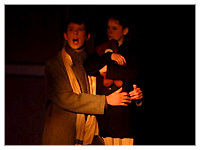 "Now that I know the play," he says, "when I'm singing it, I almost cry." Then-Notre Dame student Kelly McGann started PEMCo 10 years ago. 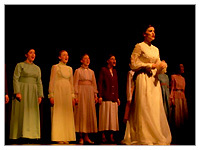 Before the group's existence, it had been years since students performed a musical on campus. PEMCo is composed of Notre Dame and Saint Mary's College students from a variety of majors, and functions on a small allocation from Student Activities and proceeds from previous performances. 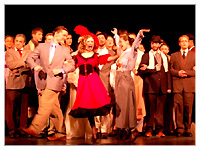 In recent years, the group has added a spring revue to its repertoire. It's not as though the company hasn't tackled more serious fare. 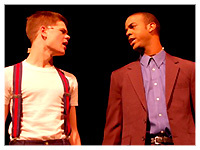 A few years ago, for instance, it performed "West Side Story." Masterton thinks, however, that people knew what to expect from that show. With "Ragtime," they may be in for a surprise. This is not a musical where you come out bopping your head and humming a tune, he says. This is the kind of show where watching it becomes "an experience." Seeing the characters go through powerful changes is an emotional process. "It really is a show full of transformations," Masterton says. He adds that although the story is marked by a good deal of pain and strife, "Ragtime" ends on a positive note: with a message of hope for the future of America. With "Ragtime," the Pasquerilla East Musical Company takes a sweeping step into deeper and far more serious territory than it has ventured towards before. 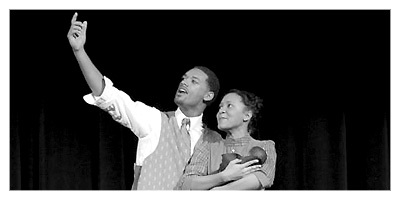 Tackling such issues as poverty, racism, motherhood, love and the spectacle of the "American dream," PEMCo's "Ragtime" is a rousing success. By far the most ambitious production that PEMCo has undertaken in recent memory, the strength of "Ragtime" is a testament to the power of a magnificent score and an earnest, energetic cast. 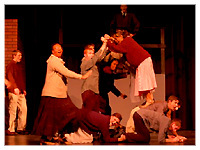 Quelling doubts regarding how well an amateur cast of students could tackle "Ragtime," a musical rife with deep social, political and emotional strife, the production is impressively well done. 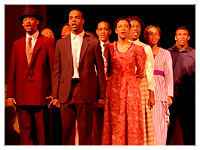 The complex and interwoven plot is set up very well with the play's opening number, "Ragtime," which juxtaposes against one another three central, conflicting groups: the upper-class, white community of La Rochelle, New York, the mass groups of immigrants from Eastern and Western Europe and the residents of New York's Harlem, and each group gives rise to a central plotline. In Harlem, ragtime-playing pianist Coalhouse Walker (Kyle Carter) intoxicates dancers with his rebellious new type of music. In New Rochelle, a typical American family headed by Mother and Father (Jacqui AcuÃ±a and Tim Politano) lives a seemingly content life of economic success. Lastly, in the Lower East Side neighborhoods of New York, Latvian immigrant Tateh (Tim Masterton, also co-producer) strives, like millions of others, to capture his piece of the great American pie. If, for any reason, a potential audience member were contemplating not seeing "Ragtime," Kyle Carter's performance as Coalhouse Walker should and will overwhelmingly persuade them to change their mind as soon as possible. Carter is remarkable in a role most doubted could be even adequately filled; he is magnetic, sweet, affable, powerful and altogether extraordinary. The depths of his surprisingly impressive voice and his mastery of Coalhouse's emotional range are striking, and, to his credit, his strengths as a performer firmly anchor the show. Acuna, as well, demonstrates her notable skill as a musical theater actress, playing the role of the unknowingly forward-thinking Mother with grace and subtlety, as well as her possessing a simply beautiful voice. 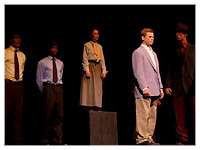 Other cast members of particular note include Will McAuliffe as Younger Brother, a man seemingly lost in the early twentieth century's tumultuous change who finds an unexpected calling; Allison Giovinazzo as Evelyn Nesbitt, a scandal-ridden media darling whose moral ambiguities capture the attention of a nation; Andrew Wright as Booker T. Washington, a figure whose educated, peace-conscious attitude towards race relations comes in jarring conflict with episodes of racially motivated violence. 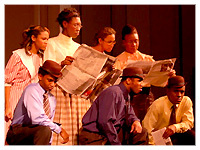 The play asks several difficult questions of its audience about the truthfulness of possibility and social mobility in America - specifically the America of a century ago, with the existence of Jim Crow laws and dirty tenements rampant, but these questions are, no doubt, still very meaningful for audiences today. With symbols of great promise, like Coalhouse's beloved Ford Model T, come also failure, unhappiness and death. The cast does a fine job of articulating the nuances of these issues, well aided by the strength of the source material. While students and professors who see a broad-shouldered young black man in class may quickly assume he is a football player - a common Notre Dame stereotype - the gradually increasing involvement of black and minority students in non-athletic organizations and events could help change that mindset. "Historically, the exposure for African-American men at Notre Dame has always been relative to sports," said Chandra Johnson, director of Cross Cultural Ministry. "That's where the stereotype comes in, and I think many African-American young men don't realize how much that misconception is entrenched in the Notre Dame community and in those who come from outside, especially during home football weekends, and how the stereotype permeates the experience of many African-American men here." Johnson, who served as assistant to University President Emeritus Father Edward Malloy, has worked with minority students on interracial issues at Notre Dame for more than a decade. In the last five years, she said she has witnessed the presence and leadership of black and minority students expand across the campus' arts and student government realms - an observation confirmed by the Pasquerilla East Musical Company's (PEMCo.) 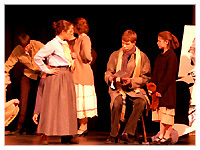 production of "Ragtime" last month. "Ragtime" organizers assembled a cast that was approximately one-fifth black, making it one of the University's most racially integrated collaborations outside a football field or a basketball court in recent years, Johnson said. 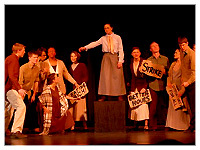 Junior Anna Mazig, director of Acting and Outreach for "Ragtime," said a handful of black students were hesitant to participate or objected to the show during its organization, a result of the language and the themes it touched. 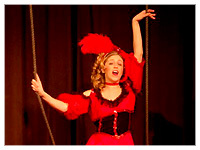 However, she did not receive any complaints following the premiere of "Ragtime." "I haven't heard a single negative thing about the show, even from the individuals who were initially skeptical towards 'Ragtime,'" Mazig said. Sophomore Kyle Carter, who played Coalhouse Walker in "Ragtime," said the production was an important stride toward exposing the artistic abilities of black students to the rest of the University community. "I already knew the African-Americans many people saw for the first time in 'Ragtime' were accomplished performers, because in what you would call 'the black community' they've had plenty of stage experience in high school, Black Images or Black Koffeehouse," he said. "However, no one else on the campus would've known about their talents without 'Ragtime.'" Another "Ragtime" co-star, sophomore Ashley Cook, also said the talents of the black community on campus went relatively unknown outside that community until "Ragtime" came along. "Every ethnic group has its own show here, and that's great because it strengthens the sense of cultural identity, but the problem is that your talents are displayed only to your racial group," she said. Sophomore Floyd Rose said he had stayed within the black community until he participated in "Ragtime." "I've always been sheltered in my own community, but when you branch out it's really a wonderful experience because you meet so many wonderful people from all colors who really care about you and want to work with you to achieve something bigger," he said. 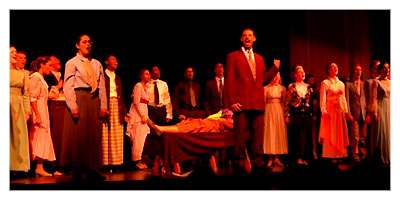 Group-specific programmingIris Outlaw, director of Multicultural Student Programs and Services (MSPS), said "Ragtime" was able to incorporate different ethnicities because the production's script tackled the theme of racial lines and consequently called for a multi-racial cast. She said she thinks the challenge ahead is integrating non-white performers in productions that don't necessarily discuss ethnicity. Different groups from different racial backgrounds already participate in events that don't directly pertain to their ethnicity, she said, citing past appearances of the Saint Mary's Irish Dance Team and the black First Class Lady Steppers in Latin Expressions, a celebration of Hispanic tradition. Junior Michelle Mas, one of the masters of ceremonies at the upcoming Latin Expressions, said there is a tradition of cross-racial collaboration in Notre Dame's ethnic programming. Under the umbrella of the MSPS, she said, a variety of ethnicities come together because "we understand the importance of each other's cultural heritage, but more importantly, because I don't think these group-specific programs are targeted at specific groups anymore." "Everybody intermingles simply because it's the natural thing to do since those racial barriers from the past are being broken a little more every day," Mas said. Mas said junior Anya Hershberger and senior Jason Laws will choreograph certain acts in Latin Expressions, though neither student is Hispanic. However, Outlaw and Johnson agreed there is a need on campus to promote entertainment programming that can feature students of all colors - outside of ethnic contexts - to compliment the segmented programming already in place, which includes Latin Expressions, Black Images and Asian Allure, among others. "I think the group-specific programming that happens on campus is very important because it strengthens the identities of the different ethnic communities here - and from there, the majority students can incorporate," Johnson said. That incorporation, she said, is now simply a matter of time. "I believe 'Ragtime' was the tip of the iceberg," Johnson added. "I believe it's already happening because there is a socially conscious population of majority and minority students." The shift to inclusivenessJohnson said she believed the engine powering the increase in the number of black artists and student government leaders on campus is the student body's growing acceptance of cultural differences. She attributed the move to the upbringing of Notre Dame students and the newspaper headlines that have steered their career courses. "Within the last five years I have noticed a marked shift in the type of student that comes to Notre Dame. I call this generation the post-9/11, post-Enron generation," she said. Johnson said Enron exposed the fraudulent activity in the business world and its disrespect for the common worker at the hands of high-ranking officials, while Sept.11 exposed the country's vulnerabilities at the homeland security level, relative to the citizens' fear of strangers and foreigners. She said today's students are in tune with the politics and the needs of the planet - but unlike their parents and grandparents, they are not afraid to cross racial lines to reach their goals. "What girds America right now is the fear of the stranger and the new generation is saying, 'We're taking the best of the best from whatever group they come from and we're going to attempt to do a better job,'" Johnson said. She applauded senior class president Sheldon Dutes and newly elected student body president Liz Brown and vice president Maris Braun - as well as the electorate - for breaking biases that in the past could have prevented black or female candidates from serving in leadership roles. "While it is true that the misconception is that most African-American students here are athletes, I feel that it is important for the ND community to recognize the contributions and involvement of African-American students in other areas besides athletics," said junior Tristan Van Voorhis, president of the Black Cultural Arts Council. Johnson said she expects more events like "Ragtime" in Notre Dame's future, but thinks they will have to be created by students. There aren't many shows that exist in American entertainment that replicate that degree of ethnic integration, she said. Johnson praised PEMCo. for its outreach to the black community and its willingness to engage in racial dialogue. The collaboration between majority and minority students is a positive step, she said. "It's a higher social consciousness from the majority students that is breaking down the barriers that have separated them from the minorities - and minority students are coming with the same desire to be a part of a broader community," Johnson said. That desire is evident in at least one student group. Mazig said several of the black cast members who first collaborated with PEMCo. on "Ragtime" - as well as minority students who sat in the audience and enjoyed the production - told her they want to permanently join the musical company. That's the case for Carter, Cook and Rose. 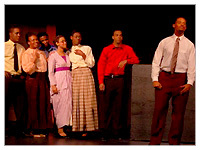 At the beginning, Carter said, the black cast members who were new to the company - as well as the first-year and Saint Mary's performers - felt estranged and distanced from the returning PEMCo. artists. However, students gradually grew acquainted with each other and became a "family," he said. Cook said she hoped more students from more ethnic pools will be encouraged to participate in PEMCo. and other non-minority groups in light of Ragtime's successful racial integration and display of teamwork. She - as well as Carter and Rose - said she's planning to stay with the company and participate in its musical revue this spring. In light of "Ragtime," Rose was optimistic about the coming years. "This is what Notre Dame could be in the future," he said. "A place where we could all accept each other and respect each other's gifts and come together as one."